H&T Presspart has stayed at the cutting edge of manufacturing for the Pharmaceutical Industry. We strive to stay ahead of the changes within this sector to ensure we are always able to offer the right solution for your needs. Our metered-dose inhaler technology is kept up-to-the-minute thanks to continual investment in research, development, and plant. 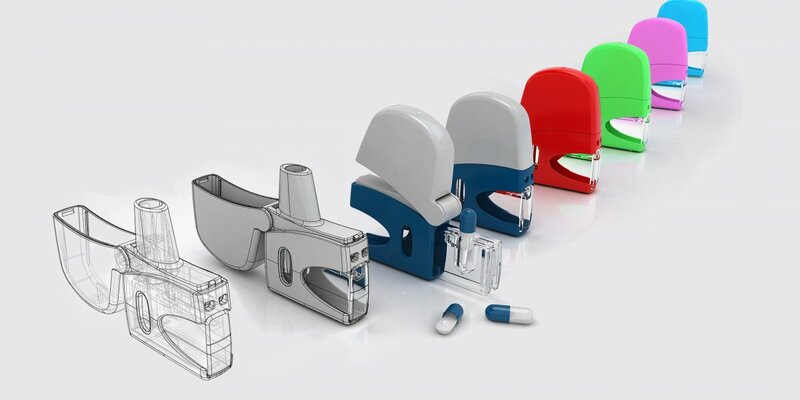 The drug delivery devices we help to create are some of the most innovative and reliable on the market. H&T Presspart specialises in MDI cans and MDI actuators, and our most recent innovative products including our eMDI, the first market-ready , smart connected MDI, as well as our Quantum Dose Indicator solution, and PowdAir Plus dry powder inhaler. H&T Presspart’s Inhalation Product Technology Centre (IPTC), our specialist R&D facility, supports our own strategic projects and innovations, and those of our pharmaceutical customers. Not only can complex designs be achieved with deep drawing technology but waste is also significantly reduced compared to other processes, and the product is superior to those made using older methods of manufacture. Products can be deep drawn from a wide range of metals. When it comes to plastics H&T Presspart also has an edge over the competition, thanks to years of experience in the injection-moulding industry. We have developed an unrivaled knowledge of the requirements of the pharmaceutical industry and as a result, we are able to offer the very latest technologies. All pharmaceutical manufacturing, including the moulding and assembly of drug delivery devices, is carried out under clean room conditions. Our machinery offers robotic part handling and high-speed, fully-automated assembly, minimising the risk of human error or contamination. As part of the Heitkamp and Thumann Group, we have access to increased facilities, further tool-making capabilities, a skilled workforce we can call upon if necessary and the benefit of the additional infrastructure, strength and stability that comes with being part of a global group.